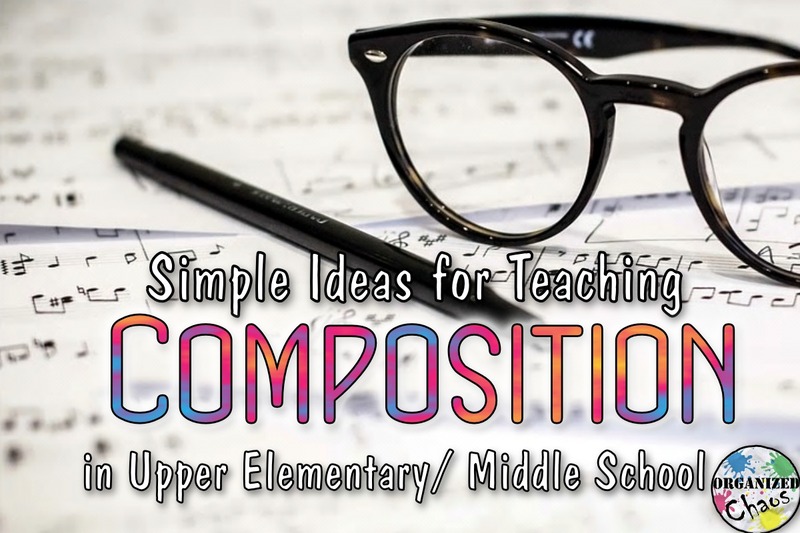 Composition is something that I have grown to love over my years of teaching, and I now feel strongly that it is a key component of any general music curriculum. The new National Core Arts standards certainly reinforce that, with an entire section devoted to the creating process. Last week I shared some of my favorite tips for incorporating composition in the lower elementary grades, and today I want to share some of my favorite tips for composition in upper elementary / middle school grades. 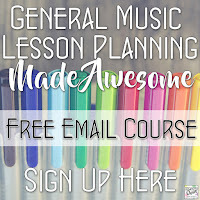 I've also included a link-up at the end of this post so that other bloggers can share their favorite ideas for getting students creating music, so make sure you check out all of those posts as well! If they can demonstrate mastery of a musical concept in 4 measures, there's no reason to make them trudge through 12 more. When I am asking students to compose a melody, I generally keep it to 4 measures. It may end up seeming a bit more like a phrase to the trained ear, but with the proper beginning and end it is enough to cover everything, whether that is dynamics, a particular scale or mode, or a certain rhythmic element. Decide what the concept is that you're focusing on and figure the minimum length that you need in order to give students the opportunity to properly contextualize the concept within their creation. I usually keep some extra staff paper around so that those high flyers who finish quickly and are still interested can double or quadruple the length of their composition on their own! For example, if you're working on using a particular time signature, you really only need a 2 measure phrase. Have students create a 2-measure rhythmic ostinato to perform with a song you have learned in class within that meter. Done! I used to think that students this age would thrive on more freedom so they could "express themselves" better. Nope. If they were already fluently using all of the rhythmic, pitch, and other musical elements that they could possibly use, then that would be fine. But (contrary to what they themselves might try to tell you) most of them don't actually know all of that stuff that fluently yet. I have found "banks" for rhythms, pitches, and other elements (depending on what you're working on) to be incredibly beneficial. I used to think it was cheating- kinda like writing the letter names in under the notes when they are learning to read music, or giving them a word bank with all of the answers to a multiple choice test- but I now believe that it really isn't at all. The point of composition is to develop the ability to use musical elements appropriately in context, and to musically express something original. By giving them a "bank" of rhythms or pitches they can choose from, they are far less overwhelmed by the blank sheet of paper in front of them and can focus on the skills that they actually should be developing. If you want to see some examples of rhythm and pitch banks, here are the composition worksheets I've made. Students at this age really want to feel like they are learning something that applies to the "real world"- and rightfully so! I have found that students are so much more motivated when they feel like they are creating something with an *actual* purpose, creating something that is "real music", or composing in the same way that people do in "real life". There are other benefits to giving meaning and context to compositions: it is much easier for students to think about the message they want to communicate through the composition, and you will have ready-made exemplars to show students as well. There are a few ways to go about providing meaning and/or context to a composition activity: 1) compose something that will be performed outside of class, 2) compose something that will be entered into a contest or otherwise presented to people outside of their class, or 3) compose something within a genre that is currently active. I'm sure there are more ways to do this as well, but those are some of the examples I use in my own teaching. Here are some examples for each category: 1) Have students perform their compositions in a concert or other public performance, or go visit another class in the school to perform it for them. The compositions could also be performed by someone else, whether that be a younger grade, or one of the school's ensembles, or another performer in the community. 2) Every so often I have come across composition contests online, and I have had students compose something to enter into the contest. Knowing their work is going to be judged definitely provides some extra motivation! Another way to "present" their compositions would be to have students write a new school song to present to school or district administration. 3) Even if their compositions are never seen or heard outside of the classroom, you can contextualize a composition assignment by framing it within a genre that they could actually see themselves writing for as an adult. For most students, that means classical music is out. But there are plenty of other genres for which composers are actively making music today that students themselves interact with in their daily lives: TV commercials and jingles, movies, video games, and pop music are just a few examples. For the last few years I have been doing units on movie music and video game music with my upper elementary students and they are always wonderful learning opportunities that the students remember for years (I recently added those resources to my store if you're looking for ideas- here's the movie project and here's the video game one). And my students are always shocked to learn how many pop songs use the same 3 or 4 chords! One of the first composition projects that I developed for my upper elementary students was a chord progression study. Chords can be a difficult concept, and the progression of those chords even more so, but I've found some great ways to teach those concepts and the students really "get it" when I show them how easily they can use just a few chords to build pop songs. I know I started this post saying it's better to narrow the focus of a composition to as few musical concepts as possible, but now I'm going to (somewhat) contradict myself. One way to really get students thinking about their composition while also "chunking" the concepts into more manageable amounts is to revisit a composition to add things. For example, I will sometimes have students create a rhythmic composition, then later (after several lessons on something else) go back and add pitches to make a melody, and then go back and add dynamics, etc. If you really want to have students end up with a larger "masterpiece" creation by the end of the year, this is one way to go about it. HOWEVER it's important to make sure students don't get burned out- I've often found that if I revisit the same composition too much, they get tired of looking at the same thing, or they find they no longer find their original composition is up to their standards now that they have more knowledge and experience! I have used this strategy most successfully with small group compositions. It is a great way to quickly practice a compositional task before having students try it on their own. Whew! I know this is a lot of information to digest. I hope you've found this post helpful, and I would love to hear more awesome ideas from YOU! Please leave a comment below, or if you're a blogger, please add your posts about anything music creation related to the link-up below. I look forward to reading more awesome ideas! Want more? 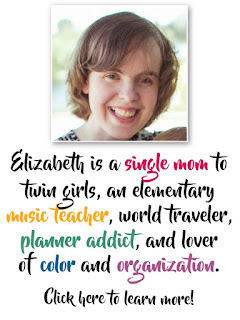 Subscribe here to the Organized Chaos newsletter and get ideas and resources for music teachers sent straight to your inbox!